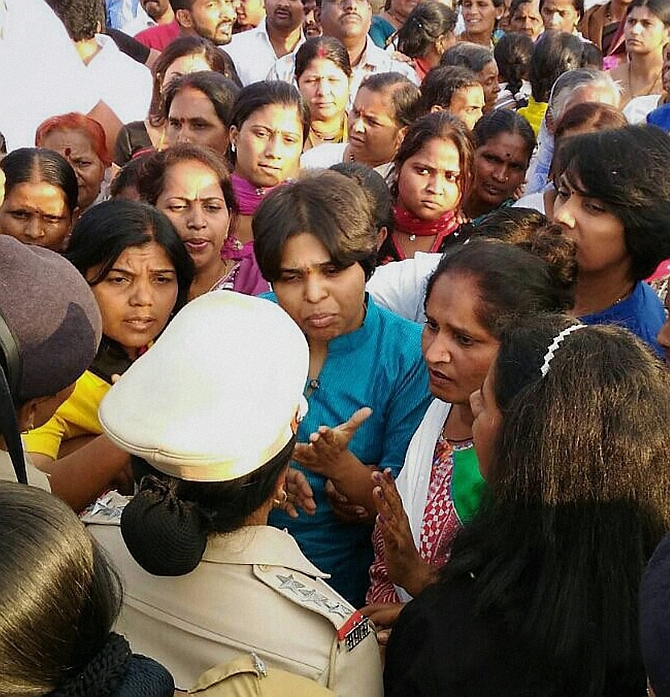 After scoring victory for women's right to enter Shani Shingnapur and Trimbakeshwar temples, Bhumata Brigade chief Trupti Desai will on Thursday try to enter the core area of Haji Ali Dargah in the city where women are not allowed. A local AIMIM leader said they would not allow Desai to enter the sanctum sanctorum of the renowned Dargah and threatened to smear her face with black ink if she does so. "We will hold a peaceful march for women's rights at Haji Ali dargah today, pray there and later decide the future course of action," Desai told reporters in Mumbai. "I think (Bollywood actors) Shahrukh Khan, Salman Khan and Aamir Khan too should lend us support for our cause as that will only help us in our fight for equality," she said. However, AIMIM leader Haji Rafat Husain said entering a graveyard is "haram" (forbidden) in Islam, and added that his party supporters will not under any circumstance let Desai enter the shrine's sanctum sanctorum. Husain also threatened to smear Desai's face with black ink, even if he gets arrested for it. "Women are barred from entering graveyards and shrines. She cannot be allowed to play with Islamic traditions for cheap publicity gimmicks. Our women volunteers will be at the shrine to prevent her entry there," Husain told PTI. "But, if she and her supporters forcefully try to enter the sanctum sanctorum, I will myself paint her face with black ink even if I have to face arrest for the act," he said. Last week, Shiv Sena leader Haji Arafat Shaikh had said Desai would be hit with "slippers" if she tried to enter the Haji Ali Dargah. However, after his remarks created a furore in various circles, Sena spokesperson Neelam Gorhe rejected Shaikh's statement and even warned of action against him. Desai had recently led a successful campaign for women's entry into the temples like Shani Shignapur in Ahmednagar district and Trimbakeshwar in Nashik. The Maharashtra government had in February this year favoured the entry of women into the Haji Ali Dargah. The state government had then said before the Bombay high court that unless the Dargah Board is able to prove that ban is part of their religious practice with reference to Quran, women should be allowed to enter the sanctum sanctorum of Haji Ali. The Dargah Board had said that the sanctum sanctorum of the dargah houses the grave of a male saint and in Islam it is sin for women to touch a male saint, and hence, women are barred from touching the tomb.